This article is about Internet Protocol Television. For public television broadcasting, see Iowa Public Television. Video on demand (VOD): browse and view items in a stored media catalogue. IPTV is defined as multimedia services such as television/video/audio/text/graphics/data delivered over IP based networks managed to provide the required level of quality of service and experience, security, interactivity and reliability. The term IPTV first appeared in 1995 with the founding of Precept Software by Judith Estrin and Bill Carrico. Precept developed an Internet video product named IP/TV. IP/TV was an Mbone compatible Windows and Unix-based application that transmitted single and multi-source audio and video traffic, ranging from low to DVD quality, using both unicast and IP multicast Real-time Transport Protocol (RTP) and Real time control protocol (RTCP). The software was written primarily by Steve Casner, Karl Auerbach, and Cha Chee Kuan. Precept was acquired by Cisco Systems in 1998. Cisco retains the IP/TV trademark. Internet radio company AudioNet started the first continuous live webcasts with content from WFAA-TV in January 1998 and KCTU-LP on 10 January 1998. Kingston Communications, a regional telecommunications operator in the UK, launched Kingston Interactive Television (KIT), an IPTV over digital subscriber line (DSL) service in September 1999. The operator added additional VoD service in October 2001 with Yes TV, a VoD content provider. Kingston was one of the first companies in the world to introduce IPTV and IP VoD over ADSL as a commercial service. The service became the reference for various changes to UK Government regulations and policy on IPTV. In 2006, the KIT service was discontinued, subscribers having declined from a peak of 10,000 to 4,000. In 1999, NBTel (now known as Bell Aliant) was the first to commercially deploy Internet protocol television over DSL in Canada using the Alcatel 7350 DSLAM and middleware created by iMagic TV (owned by NBTel's parent company Bruncor). The service was marketed under the brand VibeVision in New Brunswick, and later expanded into Nova Scotia in early 2000 after the formation of Aliant. iMagic TV was later sold to Alcatel. In 2002, Sasktel was the second in Canada to commercially deploy IPTV over DSL, using the Lucent Stinger DSL platform. In 2005, SureWest Communications was the first North American company to offer high-definition television (HDTV) channels over an IPTV service. In 2005, Bredbandsbolaget launched its IPTV service as the first service provider in Sweden. As of January 2009, they are not the biggest supplier any longer; TeliaSonera, who launched their service later now has more customers. In 2007, TPG became the first internet service provider in Australia to launch IPTV. By 2010, iiNet and Telstra launched IPTV services in conjunction to internet plans. In 2008, Pakistan Telecommunication Company Limited (PTCL) launched IPTV under the brand name of PTCL Smart TV in Pakistan. This service is available in 150 major cities of the country offering 140 live channels. In 2010, CenturyLink – after acquiring Embarq (2009) and Qwest (2010) – entered five U.S. markets with an IPTV service called Prism. This was after successful test marketing in Florida. In 2016, Korean Central Television (KCTV) introduced the set-top box called Manbang, reportedly providing video-on-demand services in North Korea via quasi-internet protocol television (IPTV). Manbang allows viewers to watch five different TV channels in real-time, and read find political information regarding the Supreme Leader and Juche ideology, and read articles from state-run news organizations. The technology was hindered by low broadband penetration and by the relatively high cost of installing wiring capable of transporting IPTV content reliably in the customer's home. However, residential IPTV was expected to grow[original research?] as broadband was available to more than 200 million households worldwide in 2005. In December 2009, the FCC began looking into using set-top boxes to make TVs with cable or similar services into network video players. FCC Media Bureau Chief Bill Lake had said earlier that TV and the Internet would soon be the same, but only 75 percent of homes had computers, while 99 percent had TV. A 2009 Nielsen survey found 99 percent of video viewing was done on TV. The number of global IPTV subscribers was expected to grow from 28 million in 2009 to 83 million in 2013. Europe and Asia are the leading territories in terms of the over-all number of subscribers. But in terms of service revenues, Europe and North America generate a larger share of global revenue, due to very low average revenue per user (ARPU) in China and India, the fastest growing (and ultimately, the biggest markets) is Asia. The global IPTV market revenues are forecast to grow from US$12 billion in 2009 to US$38 billion in 2013. Services also launched in Bosnia and Herzegovina, Bulgaria, Pakistan, Canada, Croatia, Lithuania, Moldova, Macedonia, Montenegro, Poland, Mongolia, Romania, Serbia, Slovenia, the Netherlands, Georgia, Greece, Denmark, Finland, Estonia, Czech Republic, Slovakia, Hungary, Norway, Sweden, Iceland, Latvia, Turkey, Colombia, Chile and Uzbekistan. The United Kingdom launched IPTV early and after a slow initial growth, in February 2009 BT announced that it had reached 398,000 subscribers to its BT Vision service. Claro has launched their own IPTV service called "Claro TV". This service is available in several countries in which they operate, such as Dominican Republic, El Salvador, Guatemala, Honduras, Nicaragua. IPTV is just beginning to grow in Central and Eastern Europe and Latin America, and now it is growing in South Asian countries such as Sri Lanka, Nepal Pakistan and India. but significant plans exist in countries such as Russia. Kazakhstan introduced its own IPTV services by the national provider Kazakhtelecom JSC and content integrator Alacast under the "iD TV" brand in two major cities Astana and Almaty in 2009 and is about to go nationwide starting 2010. [needs update] Australian ISP iiNet launched Australia's first IPTV with fetchtv. In India, IPTV was launched by MTNL , BSNL and Jio in New Delhi, Mumbai and Punjab. APSFL is another IPTV provider in the state of Andhra Pradesh. In Nepal, IPTV was first launched by NEW IT VENTURE CORPORATION called Net TV Nepal, the service can be accessed through its app, web app and Set top boxes provided by local ISPs, another IPTV was started by Nepal Telecom called WOW Time in 2016 which can be accessed through its app. In Sri Lanka, IPTV was launched by Sri Lanka Telecom (operated by SLT VisionCom) in 2008, under the brand name of PEO TV. This service is available in whole country. In Pakistan, IPTV was launched by PTCL in 2008, under the brand name of PTCL Smart TV. This service is available in 150 major cities of the country. In the Philippines, PLDT offers Cignal IPTV services as an add-on in certain ADSL and fiber optic plans. In Malaysia, various companies have attempted to launch IPTV services since 2005. Failed PayTV provider MiTV attempted to use an IPTV-over-UHF service but the service failed to take off. Hypp.TV was supposed to use an IPTV-based system, but not true IPTV as it does not provide a set-top box and requires users to view channels using a computer. True IPTV providers available in the country at the moment are Fine TV and DETV. In Q2 2010, Telekom Malaysia launched IPTV services through their fibre to the home product Unifi in select areas. In April 2010, Astro began testing IPTV services on TIME dotCom Berhad's high-speed fibre to the home optical fibre network. In December 2010, Astro began trials with customers in high-rise condominium buildings around the Mont Kiara area. In April 2011, Astro commercially launched its IPTV services under the tag line "The One and Only Line You'll Ever Need", a triple play offering in conjunction with TIME dotCom Berhad that provides all the Astro programming via IPTV, together with voice telephone services and broadband Internet access all through the same fibre optic connection into the customer's home. In Turkey, TTNET launched IPTV services under the name IPtivibu in 2010. It was available in pilot areas in the cities of Istanbul, İzmir and Ankara. As of 2011, IPTV service is launched as a large-scale commercial service and widely available across the country under the trademark "Tivibu EV". Superonline plans to provide IPTV under the different name "WebTV" in 2011. Türk Telekom started building the fibre optic substructure for IPTV in late 2007. IPTV has been widely used since around 2002 to distribute television and audio-visual (AV) media around businesses and commercial sites, whether as live TV channels or Video on Demand (VOD). Examples of types of commercial users include airports, schools, offices, hotels, and sports stadiums, to name just a few. IPTV head-end: where live TV channels and AV sources are encoded, encrypted and delivered in the form of IP multicast streams. Video on Demand (VOD) platform: where on-demand video assets are stored and served as IP unicast streams when a user makes a request. The VOD platform may sometimes be located with, and considered part of, the IPTV headend. Interactive portal: allows the user to navigate within the different IPTV services, such as the VOD catalogue. Delivery network: the packet switched network that carries IP packets (unicast and multicast). Endpoints: User equipment that can request, decode and deliver IPTV streams for display to the user. This can include computers and mobile devices as well as set-top boxes. Home TV gateway: the piece of equipment at a residential IPTV user's home that terminates the access link from the delivery network. User set-top box: the piece of endpoint equipment that decodes and decrypts TV and VOD streams for display on the TV screen. Depending on the network architecture of the service provider, there are two main types of video server architecture that can be considered for IPTV deployment: centralised and distributed. The centralised architecture model is a relatively simple and easy to manage solution. Because all media content is stored in centralised servers, it does not require a comprehensive content distribution system. Centralised architecture is generally good for a network that provides relatively small VOD service deployment, has adequate core and edge bandwidth and has an efficient content delivery network (CDN). Distributed architecture is just as scalable as the centralised model, however it has bandwidth usage advantages and inherent system management features that are essential for managing a larger server network. Operators who plan to deploy a relatively large system should therefore consider implementing a distributed architecture model right from the start. Distributed architecture requires intelligent and sophisticated content distribution technologies to augment effective delivery of multimedia contents over service provider's network. In many cases, the residential gateway that provides connectivity with the Internet access network is not located close to the IPTV set-top box. This scenario becomes very common as service providers start to offer service packages with multiple set-top boxes per subscriber. 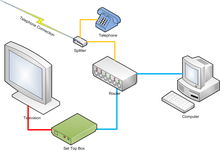 Networking technologies that take advantage of existing home wiring (such as power lines, phone lines or coaxial cables) or of wireless hardware have become common solutions for this problem, although fragmentation in the wired home networking market has limited somewhat the growth in this market. In December 2008, ITU-T adopted Recommendation G.hn (also known as G.9960), which is a next-generation home networking standard that specifies a common PHY/MAC that can operate over any home wiring (power lines, phone lines or coaxial cables). During 2012 IEC will adopt a prenorm for POF networking at Gigabit speed. This pre standard will specify a PHY that operates at an adaptable bit rate between 100 Mbit/s and 1 Gbit/s depending on the link power budget. Groups such as the Multimedia over Coax Alliance, HomePlug Powerline Alliance, Home Phoneline Networking Alliance, and Quasar Alliance (Plastic Optical Fibre) each advocate their own technologies. There is a growing standardisation effort on the use of the 3GPP IP Multimedia Subsystem (IMS) as an architecture for supporting IPTV services in telecommunications carrier networks. Both ITU-T and ETSI are working on so-called "IMS-based IPTV" standards (see e.g. ETSI TS 182 027). Carriers will be able to offer both voice and IPTV services over the same core infrastructure and the implementation of services combining conventional TV services with telephony features (e.g. caller ID on the TV screen) will become straightforward. The MultiService Forum recently conducted interoperability of IMS-based IPTV solutions during its GMI event in 2008. IPTV covers both live TV (multicast) as well as stored video-on-demand/VoD (unicast). Playback requires a broadband device connected to either a fixed or wireless IP network in the form of either a standalone personal computer or limited embedded OS device such as a smartphone, touch screen tablet, game console, connected TV or set-top box. Video compression is provided by either a H.263 or H.264 derived codec, audio is compressed via a MDCT based codec and then encapsulated in either an MPEG transport stream or RTP packets or Flash Video packets for live or VoD streaming. IP multicasting allows for live data to be sent to multiple receivers using a single multicast group address. H.264/MPEG-4 AVC is commonly used for internet streaming over higher bit rate standards such as H.261 and H.263 which were more designed for ISDN video conferencing. H.262/MPEG-1/2 is generally not used as the bandwidth required would quite easily saturate a network which is why they are only used in single link broadcast or storage applications. IGMP for subscribing to a live multicast stream (TV channel) and for changing from one live multicast stream to another (TV channel change). IP multicast operates within LANs (including VLANs) and across WANs also. IP multicast is usually routed in the network core by Protocol Independent Multicast (PIM), setting up correct distribution of multicast streams (TV channels) from their source all the way to the customers who wants to view them, duplicating received packets as needed. On-demand content uses a negotiated unicast connection. Real-time Transport Protocol (RTP) over User Datagram Protocol (UDP) or the lower overhead H.222 transport stream over Transmission Control Protocol (TCP) are generally the preferred methods of encapsulation. Adobe Flash Player prefers RTMP over TCP with setup and control via either AMF or XML or JSON transactions. Apple iOS uses HLS adaptive bitrate streaming over HTTP with setup and control via an embedded M3U playlist file. Microsoft Silverlight uses smooth streaming (adaptive bitrate streaming) over HTTP. The Internet Engineering Task Force (IETF) recommends RTP over UDP or TCP transports with setup and control using RTSP over TCP. local network content uses UPnP AV for unicast via HTTP over TCP or for multicast live RTP over UDP. Web-based content is provided through either inline Web plug-ins or a television broadcast-based application that uses a middleware language such as MHEG-5 that triggers an event such as loading an inline Web browser using an Adobe Flash Player plug-in. A telecommunications company IPTV service is usually delivered over an investment-heavy walled garden network. IPTV gateways that take broadcast MPEG channels and IP wrap them to create multicast streams. Although IPTV and conventional satellite TV distribution have been seen as complementary technologies, they are likely to be increasingly used together in hybrid IPTV networks that deliver the highest levels of performance and reliability. IPTV is largely neutral to the transmission medium, and IP traffic is already routinely carried by satellite for Internet backbone trunking and corporate VSAT networks. The use of satellite to carry IP is fundamental to overcoming the greatest shortcoming of IPTV over terrestrial cables – the speed/bandwidth of the connection, as well as availability. The copper twisted pair cabling that forms the last mile of the telephone and broadband network in many countries is not able to provide a sizeable proportion of the population with an IPTV service that matches even existing terrestrial or satellite digital TV distribution. For a competitive multi-channel TV service, a connection speed of 20 Mbit/s is likely to be required, but unavailable to most potential customers. The increasing popularity of high-definition television (with twice the data rate of SD video) increases connection speed requirements, or limits IPTV service quality and connection eligibility even further. However, satellites are capable of delivering in excess of 100 Gbit/s via multi-spot beam technologies, making satellite a clear emerging technology for implementing IPTV networks. Satellite distribution can be included in an IPTV network architecture in several ways. The simplest to implement is an IPTV-direct to home (DTH) architecture, in which hybrid DVB-broadband set-top boxes in subscriber homes integrate satellite and IP reception to give near-infinite bandwidth with return channel capabilities. In such a system, many live TV channels may be multicast via satellite (IP-encapsulated or as conventional DVB digital TV) with stored video-on-demand transmission via the broadband connection. Arqiva’s Satellite Media Solutions Division suggests "IPTV works best in a hybrid format. For example, you would use broadband to receive some content and satellite to receive other, such as live channels". Hybrid IPTV refers to the combination of traditional broadcast TV services and video delivered over either managed IP networks or the public Internet. It is an increasing trend in both the consumer and pay TV [operator] markets. Hybrid IPTV has grown in popularity in recent years[when?] as a result of two major drivers. Since the emergence of online video aggregation sites, like YouTube and Vimeo in the mid-2000s, traditional pay TV operators have come under increasing pressure to provide their subscribers with a means of viewing Internet-based video [both professional and user-generated] on their televisions. At the same time, specialist IP-based operators [often telecommunications providers] have looked for ways to offer analogue and digital terrestrial services to their operations, without adding either additional cost or complexity to their transmission operations. Bandwidth is a valuable asset for operators, so many have looked for alternative ways to deliver these new services without investing in additional network infrastructures. A hybrid set-top allows content from a range of sources, including terrestrial broadcast, satellite, and cable, to be brought together with video delivered over the Internet via an Ethernet connection on the device. This enables television viewers to access a greater variety of content on their TV sets, without the need for a separate box for each service. Hybrid IPTV set-top boxes also enable users to access a range of advanced interactive services, such as VOD / catch-up TV, as well as Internet applications, including video telephony, surveillance, gaming, shopping, e-government accessed via a television set. From a pay-TV operator's perspective, a hybrid IPTV set-top box gives them greater long-term flexibility by enabling them to deploy new services and applications as and when consumers require, most often without the need to upgrade equipment or for a technician to visit and reconfigure or swap out the device. This reduces the cost of launching new services, increases speed to market and limits disruption for consumers. The Hybrid Broadcast Broadband TV (HbbTV) consortium of industry companies is currently[when?] promoting and establishing an open European standard for hybrid set-top boxes for the reception of broadcast and broadband digital TV and multimedia applications with a single user interface. These trends led to the development of Hybrid Broadcast Broadband TV set-top boxes that included both a broadcast tuner and an Internet connection – usually an Ethernet port. The first commercially available hybrid IPTV set-top box was developed by Advanced Digital Broadcast, a developer of digital television hardware and software, in 2005. The platform was developed for Spanish pay TV operator Telefonica, and used as part of its Movistar TV service, launched to subscribers at the end of 2005. An alternative approach is the IPTV version of the Headend in the Sky cable TV solution. Here, multiple TV channels are distributed via satellite to the ISP or IPTV provider's point of presence (POP) for IP-encapsulated distribution to individual subscribers as required by each subscriber. This can provide a huge selection of channels to subscribers without overburdening Internet trunking to the POP, and enables an IPTV service to be offered to small or remote operators outside the reach of terrestrial high speed broadband connection. An example is a network combining fibre and satellite distribution via an SES New Skies satellite of 95 channels to Latin America and the Caribbean, operated by IPTV Americas. While the future development of IPTV probably lies with a number of coexisting architectures and implementations, it is clear[according to whom?] that broadcasting of high bandwidth applications such as IPTV is accomplished more efficiently and cost-effectively using satellite and it is predicted that the majority of global IPTV growth will be fuelled by hybrid networks. The Internet protocol-based platform offers significant advantages, including the ability to integrate television with other IP-based services like high speed Internet access and VoIP. A switched IP network also allows for the delivery of significantly more content and functionality. In a typical TV or satellite network, using broadcast video technology, all the content constantly flows downstream to each customer, and the customer switches the content at the set-top box. The customer can select from as many choices as the telecomms, cable or satellite company can stuff into the "pipe" flowing into the home. A switched IP network works differently. Content remains in the network, and only the content the customer selects is sent into the customer's home. That frees up bandwidth, and the customer's choice is less restricted by the size of the "pipe" into the home. This also implies that the customer's privacy could be compromised to a greater extent than is possible with traditional TV or satellite networks. It may also provide a means to hack into, or at least disrupt (see Denial of service) the private network. The cable industry's expenditures of approximately $1 billion per year are based on network updates to accommodate higher data speeds. Most operators use 2–3 channels to support maximum data speeds of 50 Mbit/s to 100 Mbit/s. However, because video streams require a high bit rate for much longer periods of time, the expenditures to support high amounts of video traffic will be much greater. This phenomenon is called persistency. Data persistency is routinely 5% while video persistency can easily reach 50%. As video traffic continues to grow, this means that significantly more CMTS downstream channels will be required to carry this video content. Based on today's market, it is likely that industry expenditures for CMTS expansion could exceed $2 billion a year, virtually all of that expenditure being driven by video traffic. Adoption of IPTV for carrying the majority of this traffic could save the industry approximately 75% of this capital expenditure. An IP-based platform also allows significant opportunities to make the TV viewing experience more interactive and personalised. The supplier may, for example, include an interactive programme guide that allows viewers to search for content by title or actor's name, or a picture-in-picture functionality that allows them to "channel surf" without leaving the programme they're watching. Viewers may be able to look up a player's stats while watching a sports game, or control the camera angle. They also may be able to access photos or music from their PC on their television, use a wireless phone to schedule a recording of their favourite show, or even adjust parental controls so their child can watch a documentary for a school report, while they're away from home. In order that there can take place an interaction between the receiver and the transmitter, a feedback channel is needed. Due to this, terrestrial, satellite, and cable networks for television do not allow interactivity. However, interactivity with those networks can be possible by combining TV networks with data networks such as the Internet or a mobile communication network. IPTV technology is bringing video on demand (VoD) to television, which permits a customer to browse an online programme or film catalogue, to watch trailers and to then select a selected recording. The playout of the selected item starts nearly instantaneously on the customer's TV or PC. Technically, when the customer selects the movie, a point-to-point unicast connection is set up between the customer's decoder (set-top box or PC) and the delivering streaming server. The signalling for the trick play functionality (pause, slow-motion, wind/rewind etc.) is assured by RTSP (Real Time Streaming Protocol). 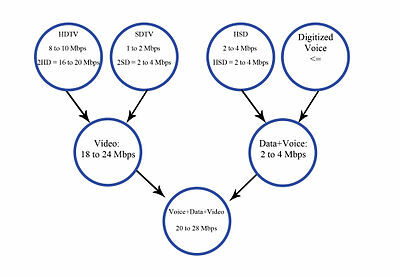 The most common codecs used for VoD are MPEG-2, MPEG-4 and VC-1. In an attempt to avoid content piracy, the VoD content is usually encrypted. Whilst encryption of satellite and cable TV broadcasts is an old practice, with IPTV technology it can effectively be thought of as a form of Digital rights management. A film that is chosen, for example, may be playable for 24 hours following payment, after which time it becomes unavailable. Another advantage is the opportunity for integration and convergence. This opportunity is amplified when using IMS-based solutions. Converged services implies interaction of existing services in a seamless manner to create new value added services. One example is on-screen Caller ID, getting Caller ID on a TV and the ability to handle it (send it to voice mail, etc.). IP-based services will help to enable efforts to provide consumers anytime-anywhere access to content over their televisions, PCs and cell phones, and to integrate services and content to tie them together. Within businesses and institutions, IPTV eliminates the need to run a parallel infrastructure to deliver live and stored video services. IPTV is sensitive to packet loss and delays if the streamed data is unreliable. IPTV has strict minimum speed requirements in order to facilitate the right number of frames per second to deliver moving pictures. This means that the limited connection speed and bandwidth available for a large IPTV customer base can reduce the service quality delivered. Although a few countries have very high-speed broadband-enabled populations, such as South Korea with 6 million homes benefiting from a minimum connection speed of 100 Mbit/s, in other countries (such as the UK) legacy networks struggle to provide 3–5 Mbit/s[needs update] and so simultaneous provision to the home of TV channels, VOIP and Internet access may not be viable. The last-mile delivery for IPTV usually has a bandwidth restriction that only allows a small number of simultaneous TV channel streams – typically from one to three – to be delivered. Streaming IPTV across wireless links within the home has proved troublesome; not due to bandwidth limitations as many[who?] assume, but due to issues with multipath and reflections of the RF signal carrying the IP data packets. An IPTV stream is sensitive to packets arriving at the right time and in the right order. Improvements in wireless technology are now[when?] starting to provide equipment to solve the problem. Due to the limitations of wireless, most IPTV service providers today use wired home networking technologies instead of wireless technologies like IEEE 802.11. Service providers such as AT&T (which makes extensive use of wireline home networking as part of its AT&T U-verse IPTV service) have expressed support for the work done in this direction by ITU-T, which has adopted Recommendation G.hn (also known as G.9960), which is a next-generation home networking standard that specifies a common PHY/MAC that can operate over any home wiring (power lines, phone lines or coaxial cables). The latency inherent in the use of satellite Internet is often held up as reason why satellites cannot be successfully used for IPTV. In practice, however, latency is not an important factor for IPTV, since it is a service that does not require real-time transmission, as is the case with telephony or videoconferencing services. It is the latency of response to requests to change channel, display an EPG, etc. that most affects customers’ perceived quality of service, and these problems affect satellite IPTV no more than terrestrial IPTV. Command latency problems, faced by terrestrial IPTV networks with insufficient bandwidth as their customer base grows, may be solved by the high capacity of satellite distribution. Satellite distribution does suffer from latency – the time for the signal to travel up from the hub to the satellite and back down to the user is around 0.25 seconds, and cannot be reduced. However, the effects of this delay are mitigated in real-life systems using data compression, TCP-acceleration, and HTTP pre-fetching. Satellite latency can be detrimental to especially time-sensitive applications such as on-line gaming (although it only seriously affects the likes of first-person shooters while many MMOGs can operate well over satellite Internet), but IPTV is typically a simplex operation (one-way transmission) and latency is not a critical factor for video transmission. Existing video transmission systems of both analogue and digital formats already introduce known quantifiable delays. Existing DVB TV channels that simulcast by both terrestrial and satellite transmissions experience the same 0.25-second delay difference between the two services with no detrimental effect, and it goes unnoticed by viewers. Digital video is a combination of sequence of digital images, and they are made up of pixels or picture elements. Each pixel has two values, which are luminance and chrominance. Luminance is representing intensity of the pixel; chrominance represents the colour of the pixel. Three bytes would be used to represent the colour of the high quality image for a true colour technique. A sequence of images is creating the digital video, in that case, images are called as frames. Movies use 24 frames per second; however, the rate of the frames can change according to territories' electrical systems so that there are different kinds of frame rates, for instance, North America is using approximately 30 frames per second where the Europe television frame rate is 25 frames per second. Each digital video has dimensions width and height; when referred to analogue television, the dimension for SDTV is 720×480 pixels, on the other hand, numerous HDTV requires 1920×1080 pixels. Moreover, whilst for SDTV, two bytes (16 bits) is enough to create the colour depth, HDTV requires three bytes (24 bits) to create the colour depth. Thereby, with a rate of 30 frames/second, the uncompressed data rate for SDTV becomes 30×720×480×16,[vague] in other words, 147,456,000 bits per second. Moreover, for HDTV, at the same frame rate, uncompressed date rate becomes 30×1920×1080×24 or 1,492,992,000 bits per second. Using that simple calculation, a service provider's service delivery to the subscribers is limited unless a lossy compression method is used. There is no absolute answer for the bandwidth requirement for the IPTV service because the bandwidth requirement is increasing due to the devices inside the household. Thus, currently compressed HDTV content can be delivered at a data rate between 8 and 10 Mbit/s, but if the home of the consumer equipped with several HDTV outputs, this rate will be multiplied respectively. The high-speed data transfer will increase the needed bandwidth for the viewer, at least 2 Mbit/s is needed to use web-based applications on the computer. Additionally to that, 64 kbit/s is required to use landline telephone for the property. In minimal usage, to receive an IPTV triple-play service requires 13 Mbit/s to process in a household. Due to limitations in bandwidth, an IPTV channel is delivered to the user one at a time, as opposed to the traditional multiplexed delivery. Changing a channel requires requesting the head-end server to provide a different broadcast stream, much like VOD (For VOD the stream is delivered using unicast, for the normal TV signal multicast is used). This could enable the service provider to accurately track each and every programme watched and the duration of watching for each viewer; broadcasters and advertisers could then understand their audience and programming better with accurate data and targeted advertising. In conjunction with regulatory differences between IPTV and cable TV, this tracking could pose a threat to privacy according to critics. For IP multicast scenarios, since a particular multicast group (TV channel) needs to be requested before it can be viewed, the same privacy concerns apply. A small number of companies supply most current IPTV systems. Some, such as Movistar TV, were formed by telecoms operators themselves, to minimise external costs, a tactic also used by PCCW of Hong Kong. Some major telecoms vendors are also active in this space, notably Alcatel-Lucent (sometimes working with Movistar TV), Sri Lanka Telecom, Ericsson (notably since acquiring Tandberg Television), NEC, Accenture (Accenture Video Solution), Thomson, Huawei, and ZTE, as are some IT houses, led by Microsoft. California-based UTStarcom, Inc., Tennessee-based Worley Consulting, Tokyo-based The New Media Group, Malaysian-based Select-TV and Oslo/Norway-based SnapTV also offer end-to-end networking infrastructure for IPTV-based services, and Hong Kong-based BNS Ltd. provides turnkey open platform IPTV technology solutions. Global sales of IPTV systems exceeded US$2 billion in 2007. Hospitality IPTV Ltd, having established many closed network IPTV systems, expanded in 2013 to OTT delivery platforms for markets in New Zealand, Australia and Asia Pacific region. Google Fiber offers an IPTV service in various US cities which includes up to 1 Gigabit-speed internet and over 290 channels depending of package via the fibre optic network being built out in Kansas City Kansas and Kansas City Missouri. Many of these IPTV solution vendors participated in the biennial Global MSF Interoperability 2008 (GMI) event which was coordinated by the MultiService Forum (MSF) at five sites worldwide from 20 to 31 October 2008. Test equipment vendors including Netrounds, Codenomicon, Empirix, Ixia, Mu Dynamics and Spirent joined solution vendors such as the companies listed above in one of the largest IPTV proving grounds ever deployed. For residential users, IPTV is often provided in conjunction with video on demand and may be bundled with Internet services such as Internet access and Voice over Internet Protocol (VoIP) telecommunications services. Commercial bundling of IPTV, VoIP and Internet access is sometimes referred to in marketing as triple play service. When these three are offered with cellular service, the combined service may be referred to as quadruple play. Historically, broadcast television has been regulated differently from telecommunications. As IPTV allows TV and VoD to be transmitted over IP networks, new regulatory issues arise. Professor Eli M. Noam highlights in his report "TV or Not TV: Three Screens, One Regulation?" some of the key challenges with sector specific regulation that is becoming obsolete due to convergence in this field. ^ "IPTV Standardization on Track Say Industry Experts". ITU-T Newslog. 27 October 2006. Archived from the original on 16 September 2011. Retrieved 17 January 2012. ^ "ATIS IPTV Exploratory Group Report and Recommendation to the TOPS Council" (PDF). Alliance for Telecommunications Industry Solutions. July 2006. Archived (PDF) from the original on 18 January 2012. Retrieved 17 January 2012. ^ "Summary of Acquisitions". Cisco. Archived from the original on 21 August 2007. ^ Hart, Timothy (15 February 1998). "KCTU-TV earns a place in television, Internet history". Archived from the original on 7 March 2007. ^ "Kingston pulls plug on IPTV service". theregister.co.uk. Archived from the original on 13 November 2017. Retrieved 25 April 2018. ^ KIT Kingston Interactive Television Archived 5 September 2015 at the Wayback Machine. Kitv.co.uk. Retrieved on 12 March 2014. ^ "NBTel leading the way in North America with Aliant's new interactive information and entertainment television service – VibeVision" (Press release). Archived from the original on 22 January 2009. ^ "Bruncor launches ImagicTV". www.thefreelibrary.com (Press release). 9 June 1998. Retrieved 25 April 2018. ^ "Aliant Telecom Launches New Television Technology in Halifax" (Press release). Archived from the original on 17 June 2008. ^ "Alcatel Acquires iMagic TV". ITBusiness.ca. 2003. Archived from the original on 14 September 2016. Retrieved 7 October 2018. ^ "Lucent Technologies Introduces First Commercial IP Video Over DSL Solution, Business Net". Business Wire. 10 April 2002. Archived from the original on 6 June 2013. Retrieved 4 February 2008. ^ "Amino selected for first HD IPTV deployment in USA". Archived from the original on 27 August 2016. Retrieved 16 August 2016. ^ (in Northern Sami) "Bredbandsbolaget is mobilizing for IP TV". Archived from the original on 27 February 2009. ^ "Internet Providers - Compare Broadband Deals from 44 Providers - WhistleOut". broadband.theage.com.au. Archived from the original on 3 March 2012. Retrieved 25 April 2018. ^ "CenturyLink Quietly Launches Prism IPTV Product". Telecompetitor.com. Archived from the original on 6 July 2017. Retrieved 15 June 2013. ^ "Worldwide Consumer Broadband Penetration Sees Rapid Growth but Current Price Strategy Alone is Not Sustainable for Telecom Carriers Says Gartner". gartner.com. Archived from the original on 26 September 2012. Retrieved 25 April 2018. ^ Eggerton, John (14 December 2009). "Broadcasters Squeezed by Convergence Push". Broadcasting & Cable. Archived from the original on 11 January 2012. Retrieved 17 December 2009. ^ "BH Telecom: BH Telecom - početna". www.bhtelecom.ba. Archived from the original on 29 June 2017. Retrieved 25 April 2018. ^ "Interactieve TV - Wat is Interactieve TV? - KPN". www.kpn.com. Archived from the original on 6 December 2009. Retrieved 25 April 2018. ^ "UZONLINE - Тарифы на Интернет". uzonline.uz. Archived from the original on 12 January 2018. Retrieved 25 April 2018. ^ "Media + Networks". www.iptv-news.com. Archived from the original on 22 July 2009. Retrieved 25 April 2018. ^ "PLDT HOME leads fixed broadband market, adds six times more subscribers than competition". PLDT Incorporated. 25 May 2016. Archived from the original on 29 May 2016. Retrieved 17 February 2016. ^ "Turkey's iptv, Tivibu Ev is on air" ntvmsnbc.com, 23 February 2011. ^ "inwf.com". www.inwf.com. Archived from the original on 22 December 2016. Retrieved 25 April 2018. ^ "HomePlug Alliance keeps plugging away at powerline communications". engadget.com. Archived from the original on 22 December 2017. Retrieved 25 April 2018. ^ "20 Million MoCA Nodes Have Been Shipped". Reuters. 17 February 2009. Archived from the original on 23 January 2010. ^ "Why AT&T Likes HomePNA - Light Reading". lightreading.com. Archived from the original on 12 October 2012. Retrieved 25 April 2018. ^ SmartGridToday.com. "5 stories in 2 minutes". www.smartgridtoday.com. Archived from the original on 10 March 2012. Retrieved 25 April 2018. ^ "Search & Browse Standards". pda.etsi.org. Archived from the original on 28 July 2013. Retrieved 25 April 2018. ^ "IMS-based IPTV services – architecture and implementation" (PDF). city.ac.uk. Archived (PDF) from the original on 17 April 2016. Retrieved 25 April 2018. ^ "MSforum.org" (PDF). msforum.org. Archived from the original (PDF) on 13 April 2016. Retrieved 25 April 2018. ^ 19.46 Europe/London (14 October 2009). "UK and France lead with hybrid IPTV set-tops". Broadbandtvnews.com. Archived from the original on 28 July 2013. Retrieved 15 June 2013. ^ "HYBRID Set Top Boxes for IPTV | Digital Media Strategy by Jeff Vinson". Jviptv.wordpress.com. 25 June 2009. Archived from the original on 19 July 2013. Retrieved 15 June 2013. ^ "New European initiative merges television with the power of the Internet" (PDF) (Press release). HbbTV Consortium. 27 August 2009. Archived from the original (PDF) on 7 October 2009. ^ "ADB Delivers World's First Hybrid, Single-Chip, Advanced Video Coding, High Definition IPTV Set-Top Boxes To TELEFÓNICA". Digitaltvnews.net. Archived from the original on 27 February 2012. Retrieved 15 June 2013. ^ "IPTV Americas Launches First IPTV Satellite Distribution Platform for Latin America and The Caribbean via SES NEW SKIES' NSS-806" (Press release). IPTV Americas. 13 January 2009. Archived from the original on 16 October 2011. ^ "Future Looks Bright For IPTV" Archived 6 March 2009 at the Wayback Machine Satellite Today. Retrieved 18 January 2009. ^ "The Economics of IPTV". 2 February 2015. Archived from the original on 20 September 2016. Retrieved 23 July 2016. ^ "AT&T Participating in G.hn Standard Development". everywire.com. Archived from the original on 10 August 2017. Retrieved 25 April 2018. ^ (CRTC), Government of Canada, Canadian Radio-television and Telecommunications Commission. "TV or Not TV: Three Screens, One Regulation?". www.crtc.gc.ca. Archived from the original on 13 December 2017. Retrieved 25 April 2018.